Used Jeep Cherokee SUVs combine family-friendly comfort and rugged off-road performance. When it debuted more than 20 years ago, the Jeep Cherokee was a rugged, rear-wheel-drive SUV. Today, it’s a compact crossover stocked with all the latest tech and comfort innovations. Before you test-drive yours, check out our buying guide to learn more about what you can expect on the used lot. Why buy the second-generation used Jeep Cherokee? 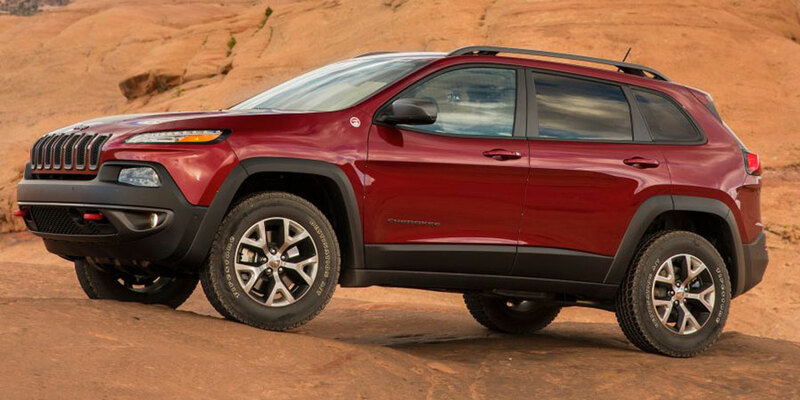 Unlike the previous generation, which was a rugged, rear-wheel-drive SUV, the modern Cherokee is a family-friendly compact crossover. Still, it’s more than capable on the trail. For the most adventurous ride, look for a used model with one of the Cherokee’s three available four-wheel-drive systems. Inside, you’ll find a spacious cabin and all the latest convenience technology. Depending on trim model, this sporty crossover even adds a bit of luxury to your daily grind, with upscale features like leather upholstery and heated seats. This generation of used Jeep Cherokee SUVs also supplies the latest in high-tech safety aids, keeping you extra vigilant with features like blind-spot monitoring and rear parking sensors. How has the second-generation used Jeep Cherokee changed over the years? As this generation progressed, its list of cutting-edge tech features grew. In 2015, Jeep made the forward collision mitigation system an option. In the face of a potential collision, this technology automatically hits the brakes to help you avoid or reduce damages. For 2016, the options list grew again. Jeep’s modern infotainment system, Uconnect, introduced Siri Hands Free compatibility, keeping iPhone users connected with minimal distraction. That same year, Uconnect introduced its Do Not Disturb function. This cutting edge feature comes in handy in bad weather or rush-hour traffic, sending your calls straight to voicemail. Why buy the original Jeep Cherokee? Most of these model years are a rare sight at car dealerships, but the original Jeep Cherokee is quickly becoming a classic. When it debuted, this sporty SUV was big on rugged capabilities. Its unibody construction was a radical feature at the time, but its short wheelbase made it nimbler and more responsive than its then-competitors, the Ford Bronco and the Chevy Blazer (neither of which are still currently on the market). These used Jeep Cherokee models received a significant makeover back in 1997. These new models came of the line with chiseled exterior styling, bringing them up to date with rugged silhouettes of the era. These SUVs were also updated to deliver enhanced off-road capabilities, though they still aimed to please back on the pavement.